Nick Oliveri, infamous bassist and founding member of Queens of the Stone Age who parted ways with them at their peak in 2004. Gaining notoriety after the demise of epic stoner-rock band, Kyuss, Nick Oliveri has been a long-standing rotating member of the vile Dwarves (as Rex Everything) and continues full time with his rock trio Mondo Generator. Nick Oliveri will play an extended acoustic set of songs from his extensive catalog. Expect an hour to an hour and a half of songs. Side note: He worked at Stubb’s in Austin back in the day. 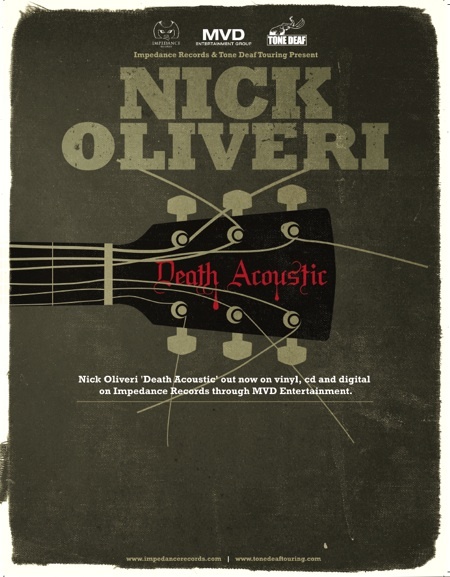 Nick Oliveri is touring in honor of his solo album, Death Acoustic, released by Australian label Impedance Records. @ Double-Wide on February 21st at 8pm. This entry was posted on December 22, 2009 at 1:38 am, filed under News.